Localization of two or more antigens on the same tissue section is a powerful research tool that can provide valuable insights into cellular biochemistry, protein-protein interactions, and spatial relationships of biomarkers. Our detection systems and enzyme substrates have been developed and rigorously tested to deliver the high sensitivity, low background, and extreme clarity that is required to differentiate multiple epitopes simultaneously. You can choose to use the same enzyme system with different substrates or different enzyme systems and their respective substrates. For a detailed description of these applications, protocols, and additional images please visit our website or request a free copy of our guide, Discovery Through Color: A Guide to Multiple Antigen Labeling. 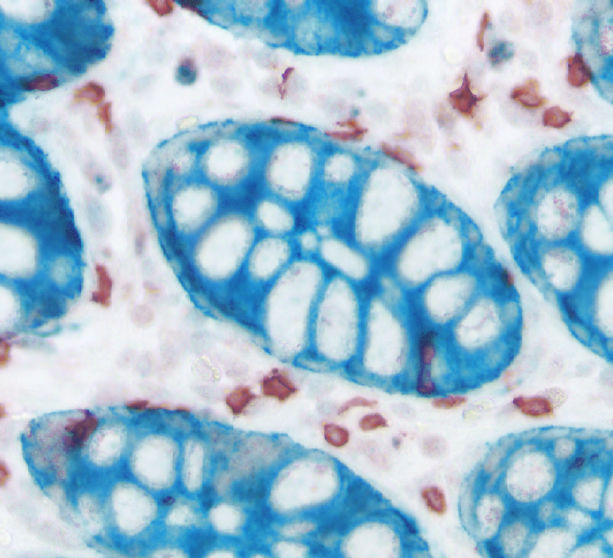 Colon: • Cytokeratin (AE1/AE3, m), ImmPRESS®-AP Anti-Mouse IgG Reagent, Vector® Blue AP Substrate (blue) • CD3 (rb), ImmPRESS® Anti-Rabbit IgG HRP Reagent, ImmPACT® AMEC Red HRP Substrate (red).